Let the race to the holidays begin! 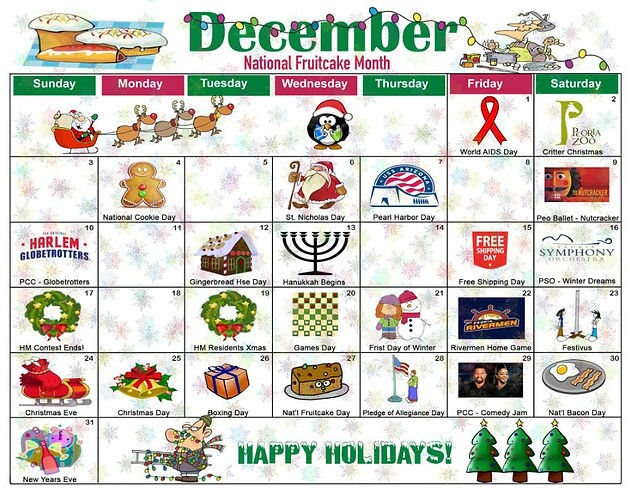 December is packed full of events and holiday celebrations, and (not)coincidentally it&apos;s also Fruitcake Month! As we mentioned, we&apos;ve got the calendar to prove it too! Whether you&apos;re looking for events to do around town or really want to know when Fruitcake Day is, we&apos;ve got it covered on the Haymeadow December Calendar of Events! You may notice too that we are having a December Deck Your Halls Contest (on the calendar) and another Cookies and Cocoa Day for Haymeadow residents too! We hope you enjoy the calendar and encourage you to share with your friends and neighbors! Happy Holidays! And thanks for reading and sharing!